A momentary interruption (open circuit) in the connectors and/or wire harness between the sensors and ECUs can be detected using the ECU Data List function of the Techstream. (e) Follow the directions on the Techstream to display the Data List and select areas where momentary interruption should be monitored. If the status remains on (Error displayed), check the continuity between the ECU and the sensors, or between ECUs. 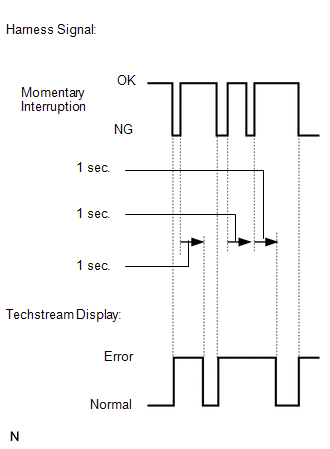 The Error display on the Techstream remains on for 1 second after the harness signal changes from momentary interruption (open circuit) to normal. (f) While observing the screen, gently jiggle the connector or wire harness between the ECU and sensors, or between ECUs. 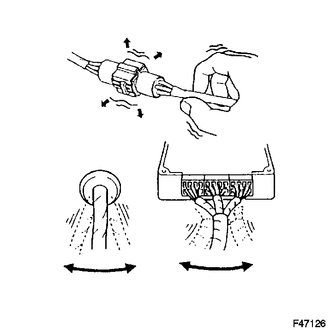 The connector and/or wire harness has a momentary interruption (open circuit) if the display changes. Repair or replace the connector and/or wire harness as one of them is faulty.